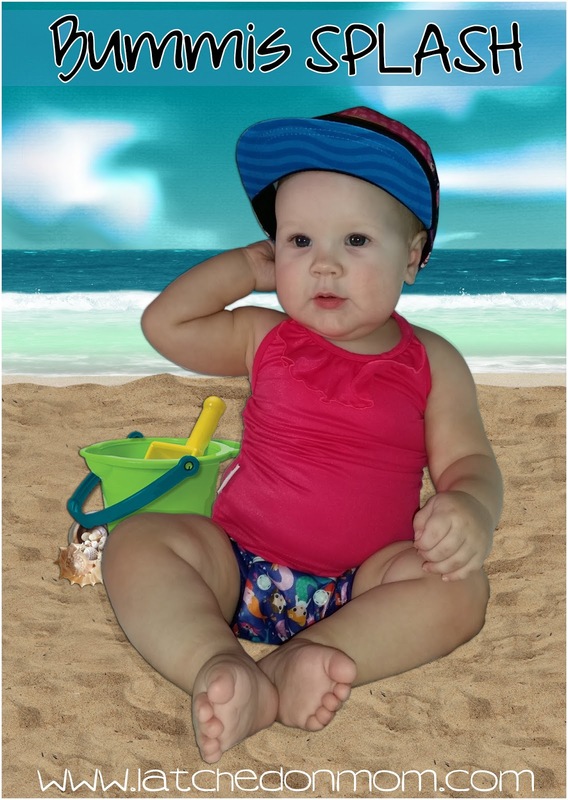 If your family is headed to the ocean, lake, pool or splashpad this summer, you're most likely looking into swimwear for your little one. Swimming with cloth diapers is highly economical because of all the money you save with them being reusable, but also using a product requiring less resources and production to manufacture. Plus, by using cloth swim diapers, it really adds more fun and fashion for you (so many adorable prints to choose from) and baby! I have never used a cloth swim diaper before, I've only used "worn-out" cloth diapers when visiting water areas with my littles, so this was a fresh experience for me. 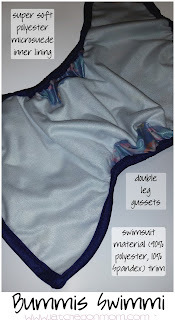 I absolutely love the style that Bummis has incorporated into this *NEW* Swim Line. There is sure to be a perfect ensemble for every baby! 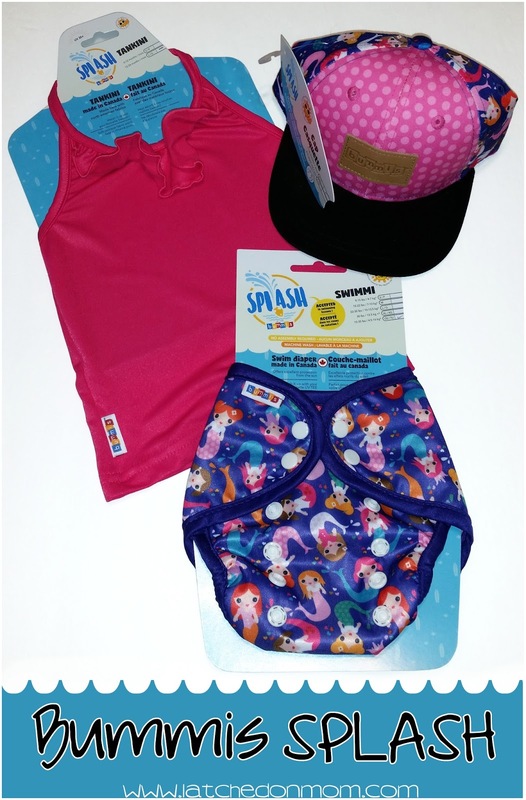 I was sent the Bummis Splash Swim line ensemble shown below in exchange of sharing my honest opinion with everyone about these products. I can't wait to tell you more about what we think about Bummis Splash! 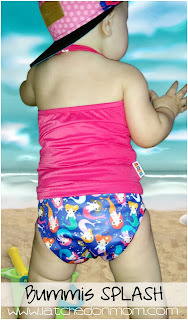 The swim diaper shown above is the one-size Bummis Swimmi in the Mermaids print. 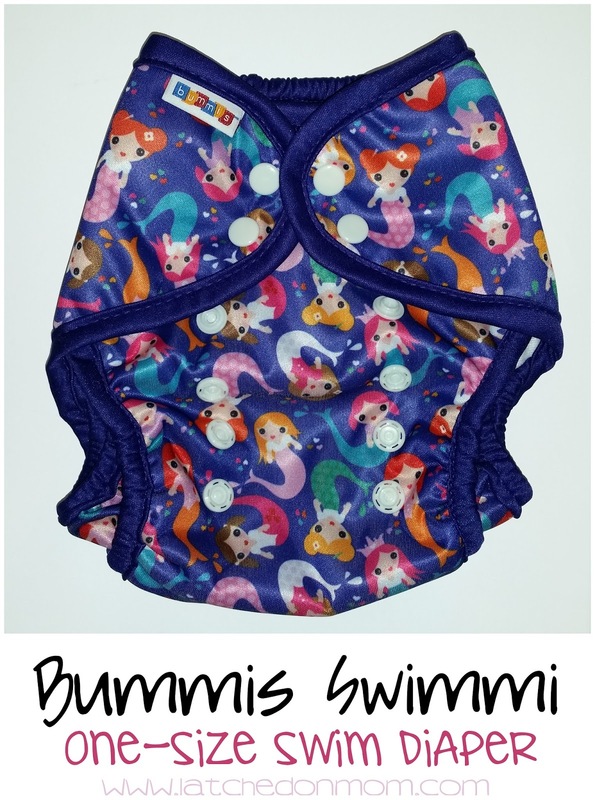 The outside fabric of the Bummis Swimmi is polyurethane laminate (PUL) and the lining is a smooth blend similar to swimsuit fabric- the tag says 90% polyester and 10% spandex, to be exact. The inner lining is a super soft polyester microsuede, similar to what you might find in a pocket diaper. The Bummis Tankini coordinates the Bummis Swimmi and is made of swimsuit-quality fabric (lycra). 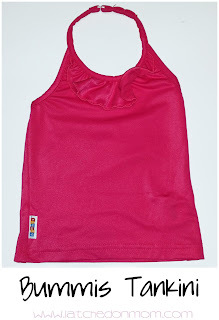 Three of the color/print options have an adorable ruffle along the neckline. The Tankini is what you'd most closely consider a halter tank top, and there are a total of three neck adjustments to get it fitted correctly. 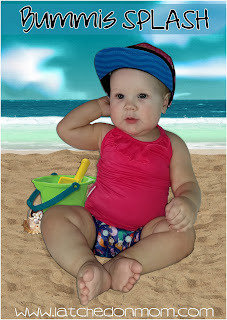 The Bummis Tankini has a UPF rating of 50 to keep baby protected from the sun. There are two sizes available: 0-12 months & 12-24 months. My 10 month old fits perfectly in the 0-12 month size and looks soooo cute in it too! I edited a couple photos to make it look like we were at the ocean. The baseball cap style is my favorite! I love the design with the cute pink polka dots added to it and it's a great way to keep the sun glare out of baby's eyes, wherever we go! 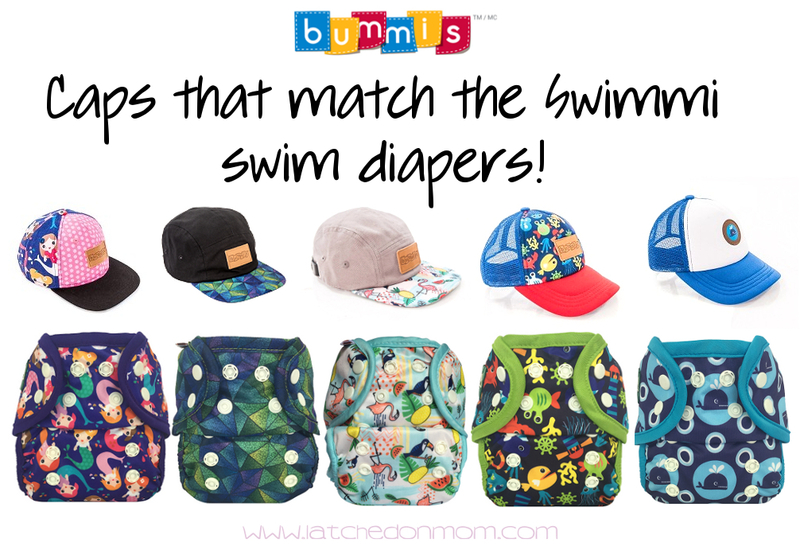 There are several other caps that match the Swimmi swim diapers, check out my graphic below to see more. What's my favorite thing about the Bummis Splash Swim Line? I love all the fabric options and coordination! It is so fun to be able to pick out something special for your little one's first time in the pool. I think Bummis hit the nail on the head with these designs! Is there anything I'd change? No! But I do have a tip... when you're on your way (or waiting to go in) to the water, make sure you have a thin insert added in there. Otherwise pee will run down their legs, and yours too- if they're in your lap! I give Bummis Splash a 10/10! 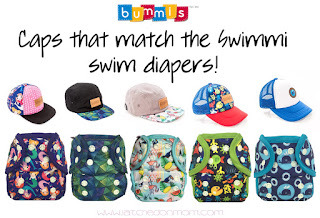 You can visit the original Splash by Bummis launch & reveal page Bummis created on Facebook to view more photos of all the products within this swim line as well! 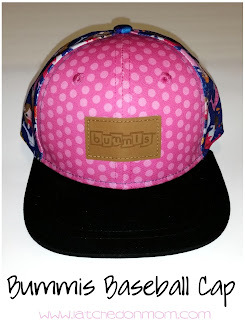 Be sure to LIKE Bummis on Facebook and Follow on Twitter to keep up with all new products, current promotions, giveaways and more! The Bummi's Swimmi is one of my favourite swim diapers! I love the one size option grows with my chunky fast growing babies! We are super excited for this new swim line and can't wait to get some matching accessories for when we hit the beach this summer! The Bummis Splash line is amazing! I cannot wait for warmer weather for my daughter to wear her matching Barberry Bird set! What a cute swim set! My little guy already has a swim diaper. 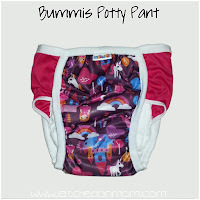 Too bad, or I would totally get a Bummis!